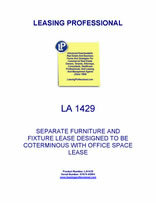 This lease is for office furniture and fixtures owned by the landlord leasing office space to the tenant. The furniture is located in the premises, and is detailed on an exhibit to the furniture lease. The parties can make additions or deletions to the furniture and fixtures during the term of the lease, with corresponding rental adjustments. The term of this furniture and fixtures lease is coterminous with that of the office lease, which is a separate document. This Lease ("Lease") is made as of _________________, by and between COMMERCIAL PROPERTY LANDLORD, INC., a __________________ corporation ("Landlord"), and AGREEABLE TENANT, INC., a _________________ corporation ("Tenant"). 1. FURNITURE AND FIXTURES. Landlord leases to Tenant and the Tenant hires from Landlord certain personal property (hereinafter referred to as "Furniture and Fixtures") generally described as office equipment including but not limited to desks, chairs, table and file cabinets as may be replaced or supplemented from time to time by Landlord or at the request of Tenant. The Furniture and Fixtures leased to Tenant initially are specified on Exhibit "A," which is attached hereto and incorporated herein by reference. If additions or deletions are made to the Furniture and Fixtures during the term of this Lease, Landlord and Tenant shall memorialize such changes on a corrected Exhibit A, and both parties shall forthwith sign and date such revised Exhibit A and then attach it to this Lease. Landlord reserves the right to adjust the rent with respect to such additions or deletions during the term hereof. Landlord and Tenant are parties to a certain lease for office space ("Office Lease") of even date herewith for premises in which the Furniture and Fixtures are located. The terms of this Lease and the Office Lease are coterminous. 2. TERM AND RENT. This Lease is for a term of sixty (60) months commencing on ______________, and ________________, for a monthly rent of ____________ Dollars ($_____) to be paid by the Tenant to Landlord in monthly installments on the 1st day of each and every month during the term hereof. Upon expiration of the Term, Tenant shall purchase for cash consideration, all (but not less than all) of the Furniture and Fixtures for an amount equal to _____________ Dollars ($____) plus all applicable sales, use and other taxes thereon, on an "as is, where is" basis. 3. SECURITY INTEREST. In order to secure payment and performance of Tenant's obligations hereunder, Tenant hereby grants Landlord a security interest in (i) the Furniture and Fixtures, and (ii) all proceeds of such property, including but not limited to insurance proceeds. 4. TAXES AND OTHER CHARGES. (a) The Tenant shall pay all use taxes, personal property taxes or other direct taxes imposed on the ownership, possession, use or operation of the Furniture and Fixtures or levies against or based upon the ownership, title or property rights or interest in and to said equipment and the same shall be billed to the Tenant by the Landlord as it comes due. (b) All certificates of title or registration applicable to the Furniture and Fixtures shall be applied for, issued and maintained in the name of the Landlord as owner, and the Tenant shall pay all costs in relation thereto. (c) If the taxes, licensing, registration or permit fees, fines or other charges that the Tenant is responsible for under this paragraph are levied, assessed, charged, or imposed against the Landlord, it shall notify the Tenant in writing of such fact. The Landlord shall have the option, but not the obligation, to pay any such tax, licensing, registration, or permit fee, fine or other charge whether levied, assessed, charged or imposed against the Landlord or the Tenant. In the event such payment is made by Landlord, the Tenant shall reimburse the Landlord within seven (7) days after receipt of an invoice thereof, and the failure to make such reimbursement when due shall be deemed a default on the part of Tenant. 5. MAINTENANCE AND REPAIR. The Tenant shall pay all expenses at the Tenant's sole cost and expense to keep the Furniture and Fixtures in good repair, mechanical condition and operating order. (a) Tenant shall at its own cost and expense make all repairs as may be necessary to keep and maintain Furniture and Fixtures at all times in first class condition and repair. (b) Tenant, at Tenant's own cost and expense and without any obligation or liability whatsoever on the part of Landlord, shall keep the Furniture and Fixtures in good repair, condition, and working order and shall furnish any and all parts, mechanisms and devices required to keep the Furniture and Fixtures in good mechanical and working order, all of which shall become Furniture and Fixtures covered by this Lease. (c) The Tenant shall at all times provide suitable garage facilities and appropriate service for the Furniture and Fixtures including washing, polishing, cleaning, inspection and storage space and, at the end or other expiration of this Lease, shall return the Furniture and Fixtures to the Landlord at the address above set forth in the same condition and state of repair as it was at the date of delivery, ordinary wear and tear excepted.